Please DO NOT bring treats or food for the horses, except bags/boxes that can be added later into their grain. MUCK PARTY! Sunday (Jan 12, 2014) 1pm – 3pm EVERYONE WELCOME! 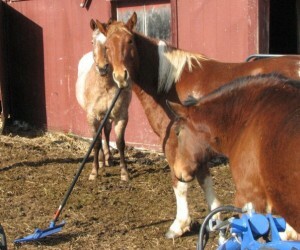 Great weather for a get together to clean up the previously frozen-to-the-ground horse manure. 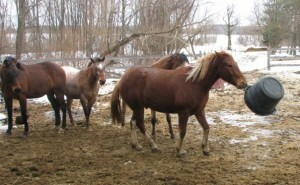 In frigid weather, horse manure actually freezes like baseballs. It is easier to “rake” them up now, then when they thaw completely. So come on out and join us for a Muck Party! The horses are excited to meet and greet you! They love visitors. LOTS AND LOTS OF HORSE STUFF!!! Tee (in pictures) says he’ll show you how to rake and empty buckets! We are actually located in the Town of Florida. From Exit 27 of NYS 90, go south about 3 miles on Route 30. You will be in the Hamlet of Minaville. DO NOT BLINK or you will miss us. Just a few feet past the church is the beginning of Langley Road – turn left onto Langley and go about 50 feet. We are 2nd place on left with white colonial house, white vinyl horse fence and red historical barn. Can’t wait to see you Sunday!!! We need lots of help! Please donate yourself for a couple hours for the horses. You WILL make a difference! 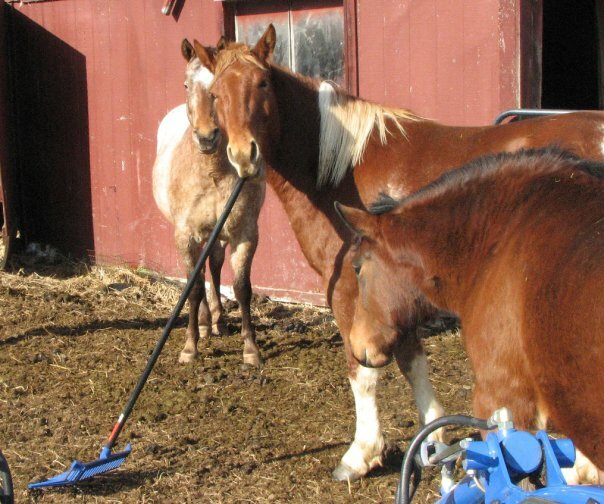 After mucking, if you want to brush horses – they would love you for it! Dress warm in layers (folks tend to get warm as they work). Boots good for snow or ice or melted ice recommended, along with very warm socks. Hat and mittens/gloves a must. All donations fully tax deductible.